BRUU is an active congregation throughout the year. We meet every Sunday morning for worship services, with a nursery for baby care during the service, 52 weeks a year. We celebrate holidays of many traditions with special services. Typically, 75-100 people attend the average Sunday Service. A Fellowship Hour provides coffee, snacks, and time for discussion, socializing, and meetings of the different groups organized at BRUU. Organized religious education classes for our children/youth are held on Sunday mornings from September-June. We sponsor nature hikes, softball teams, volleyball games, and family picnics in the Spring, Summer, and Fall. The Auction each November offers members a chance to sell dinners, game nights, and a variety of services that continue throughout the year, enabling people to meet others in small groups while having fun. In the Winter we are still busy, though many activities move indoors. Our Social Justice programs, including food distribution to the poor located in the Manassas area, continue year-round. Parties and social events never stop – we are an unusually energized congregation with some sort of programming every week. It is easy to find someone at BRUU with a common interest; we have roughly 250 members, including many in their 20’s and their 80’s. Often, there are two or more events scheduled, offering some choices regarding how to engage with others within our community. We have one Sunday Service, starting at 10:00am. Announcements start five minutes before services. After each Sunday Service, we gather for fellowship over coffee and snacks in the Fellowship Hall below the Sanctuary. Don’t be surprised if during the first music/hymn, people get up from the pews to light a candle at the front of the Sanctuary, for a personal and silent moment. Some Sundays, we structure a public “Joys and Sorrows” time during the service for members and friends to speak about major events in their lives. Some services do not follow this model, particularly our summertime lay-led services and the two annual choir services in December and June. The BRUU music ministry presents two services each year that are devoted to music as worship. 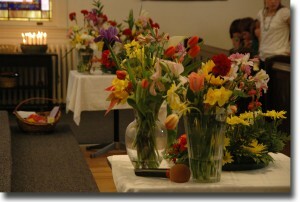 In June the adult choir presents a Spring music service. In December, there is a holiday music service with the adult, youth, and children’s choirs. Because of the wide variety of services, we encourage you to come to two or three services to get a true sense of BRUU. In particular, we invite you to visit when the adult choir is singing (usually the second and third Sundays). Evensong services, incorporating music and readings and art, are held every three months or so on Friday nights at 7:30-8:30pm. Social Justice projects include the Food Pantry on the first and third Sundays of each month, from 9:30am-2:00pm. The USDA Food distribution is on the 2nd Friday of every month, from noon-2:00pm. Once a month, we have a “Soup Sunday” and eat lunch in the Fellowship Hall after the Sunday Service. Contributions for lunch go to a local Social Justice-related project.